I think drawing is important. Let me preface this by saying that this isn’t some highly developed theory but it something I feel pretty strongly. I’ve thought about this for a while actually. My theory depends on the idea that there are essentially two types of people. Creative and non creative people. This is part of the theory that I don’t exactly cling to but it helps build my argument. I think that drawing is really where this separation happens. I think that everyone draws when they’re around the age of 4-6 and at some point that number goes from 100% to somewhere in the 15-30% (again, not based on facts, just opinions) and I think that 15-30% ends up being the creative people of the world. I think that being able to draw gives you the confidence to explore ideas that need to be visualized. In all creative fields, except maybe music, the ability to put an idea on paper gives you a leg up. For me, drawing has never been something that I’ve felt was my true calling. I’ve always like to do it but Ive found that videos and animation are what I really like to do. Animation relies very heavily on drawing so that connection is easy but it’s less easy when you think about film. Being able to draw a storyboard with detail gives you an advantage when it comes to filming. Also, being able to draw helps you to visualize a scene and how it will look more accurately because you have developed the skills to create an image in your mind. Drawing on it’s own has also become a larger part of my life recently. I’ve been trying to find a job and am currently talking with an organization that says they’re looking for a graphic designer but it sounds like they are just looking for an illustrator. So as I send my drawings and ideas to this person, Im realizing how important all that doodling instead of note taking has really been. I’ve always considered drawing to be something I do when I need to get away. Transitioning to an academic setting was actually quite difficult for me. I definitely learned a lot from this course, but I think I work in a much different manner when it comes to how I express myself in my drawings. At this point I’m pretty sure everyone in my class is aware of just how much I dislike realism. I have the utmost respect for artists who can work well within that realm, but I think my upbringing exposed me to a different side of drawing. I didn’t have any expectations when it came to this class, but I certainly wasn’t expecting the observation-heavy side of drawing. I grew up with a particular fascination with comics and cartoons, specifically The Hulk, so when it came to learning how to draw, I did not fit in well with the rest of the class. There’s a certain phrase in jazz music that states the importance of learning all the rules so you can break them so I understand the importance of learning drawing from observation, I just have a rebellious attitude towards it all. I’ve never taken an art course in my life, so to be exposed to drawing in this manner was honestly a big shock. To me, drawing is about humor. I’ve always had that attraction to drawing. I love the ability to make someone laugh just from a simple sketch. I’m also a huge fan of minimalism, which I know is very apparent in my sketch book. I don’t want to make it seem like I didn’t enjoy this class at all (because I most definitely did), I just wish I could express more of my aesthetic in the work in class. I also had the opportunity to meet Bill Fick (honestly, my favorite professor up to this point at Duke) who works a lot with screen prints and other artists in the Durham area who I respect very much. I look back at the last 14 weeks having taken this class and I’m honestly amazed at how far I’ve come when it comes to drawing. Most of my drawings before this class dealt mainly with typography and very rough sketches of abstracted objects. Having been forced to work within the realm of observation, I started combining my own aesthetic with the assignments in class. I’m very arrogant when it comes to my art, but the fact that I had someone like Bill giving me input and encouraging me to find my ‘way’ throughout the entire semester absolutely helped me find confidence in a class that was lightyears ahead of me (in terms of technique). One thing I absolutely did not like about the class was the number of students who had obviously already studied drawing in an academic setting. At times, it did feel a little discouraging to even try. I know this is mainly just a personal problem, but the structure of the class sometimes left me feeling like I wasn’t trying (or that my efforts were not worth much). Regardless, I had a lot of fun exploring this side of drawing and being exposed to a lot of different techniques throughout the semester. And of course, I can’t express how lucky I am to have met Bill. I’m very excited to hopefully do more work with him throughout my experience at Duke. Not to mention the fact that I know have an art portfolio now! I plan on continuing to explore my artistic side, but I don’t know if I’ll find myself in an academic setting when it comes to drawing. I seem to like the more laid-back side of drawing, which I don't think is a bad thing. Or so I hope. I first encountered drawing at Duke with architecture in mind. For these modern architects, drawings were not just images but rather the distillation of their ideas into images of buildings. I grew to love their ability to convey ideas. Looking at the sketches and drawings of master architects, I saw how every element from the drawing’s large-scale composition to its small-scale lines existed to contribute to an overall meaning. However, when starting this semester, I couldn’t concern myself with meaning. Staring at that blank page for our first study drawing daunted me. The permanence of my future lines would define my drawings in perpetuity. Did I even have the time to make it through a full drawing? But through those first study drawings, my pile of eraser shavings remedied my hesitation. I gave into the paper and found drawing to be relaxing as I meticulously detailed the variations in shading across an orange juice bottle and gave vitality to the distinct lines of a coffee cup. These studies in representation built my confidence as a drawer and altered my perspective on the effort it takes to represent the physical world. The theme of representation continued throughout my sketching. I had always doodled, forming lines from my pencil in a random fashion. These doodles populate my class notes and readings and can create fantastic informal images, but rather than representation, this process reflected ideation, the formation of ideas, as my head would draw aimlessly until I could place a narrative on top of my image. But this frustrated me; these sketches and doodles failed to reify anything on my mind and only demonstrated my ability to mentally connect dots and lines on a paper. Around the beginning of the semester, rather than continue with my meanderings on paper, I turned my drawings towards the task of conscious representation. In the final drawings, my ideas have guided my lines. Constructing a narrative pushed me to guide the lines on my paper, giving some forms weight and others life. Most of all, the overarching narrative of these drawings challenged my indecision. Drawing simple objects at the beginning of class may have built my skills as a drawer, but the task of choosing a final topic lets your own persona come to fruition. My final choices of subject gave my artistry the purpose of representing my thoughts. While placing lines and forms on a paper is a physical task, the mental process of representing objects, ideas, and persona through drawing is a skill that I hope to cultivate throughout the future. In high school, when I was given the chance to choose between art or the orchestra as an elective. I had been in art classes before, both at school and outside of school, so taking art seemed like the natural choice. I knew if I joined the orchestra, I would get to go to Disney World for a concert later on in the year, so I chose orchestra. Since then, I haven’t picked up a drawing pencil. I haven’t sat down and drawn in a long time, which is why I enrolled in the class. I wanted a chance to get back to a practice that once kept me busy for hours. Starting back up was a lot harder than I expect. Simple skills like drawing straight, steady lines and knowing how to shade were difficult tasks now, and it was frustrated at first. I felt stiff and when we drew in class, it took me a long time to get in a rhythm. The more time I practiced and put hours into drawing, the better I got. And even though it might not be obvious, I think I have gotten better at drawing this past semester. I definitely wouldn’t consider myself to be a gifted or a particularly talented drawer, but I am still proud of how far I have come in this class. In the first week, I couldn’t even draw a square object with out messing up the proportions. It was intimidating to see how talented and well-practiced some of my classmates were. I compared my work to theirs, knowing I should, and I think I decided early on that I was not good at drawing. I put a lot of effort into my assignments, but still got anxious when I came to class, worried that I would have to present them to the class. It was hard not to consider the work of my classmates, but I remembered something my mom told me in the sixth grade after I was upset because I had gotten a good grade on a test but not as good as my friend’s grade. “Comparison is the thief of joy,” she told me. This phrase is kind of dumb and silly, but it kept coming back to me throughout the class. I need to focus on my own progress and my own growth and not get distracted or depressed by the work of others. Only when I realized I needed to focus on my own progress did I feel content with my particular style and works in the class. After these fourteen (is it fourteen?) weeks exploring my talents of drawing, I am not sure if I have a new outlook on the artistic process or the medium of drawing. It is a lot harder than it looks, I’ve realized, and I have the upmost respect for artists whose principal medium is in fact drawing. I am not sure its the medium for me, but I plan on continuing experimenting and exploring my style as a sketch artist. The last time I was in Casa Rosado, the old house of our family artists on the northern coast of PR, I found myself mesmerized by the giant canvases, leaning immobile against the patio wall as a strong seaside gust pressed past the sofa and chair set. Puertorriqueño art commissioned by local governments, for fairs, events, holidays. 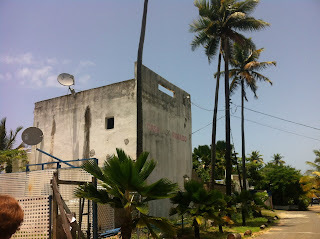 Art for tourists and nostalgia. The style, the colors, the enormity impressed me. Huge oil portraits in maroons and violets, sandwiched between city scenes and large-as-life landscapes. 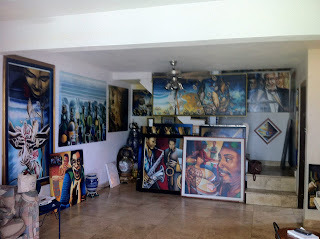 It was my first time seeing them in real life: in my bedroom, I had a small framed print of the rainforest peak of El Yunque: in the kitchen, another of abstracted Los Reyes Magos parading up some San Juan avenue. So, so much smaller than the real thing— those canvases as tall as me. 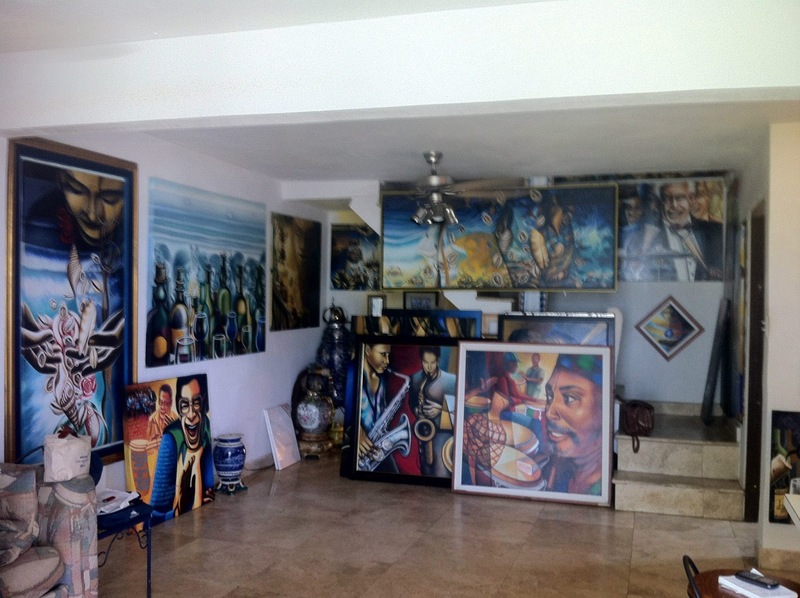 Some of the smaller canvases inside the house. An echo of that feeling came to me at the start of this class. In my family, I’m known for good attention to detail, which manifests in good lab prep/barista/paper editing skills. Even among my friend groups, I’m the small, short, energetic one, rushing to keep up with the strides of the rest of the group. (One high school graduation note from a tall friend sardonically urged me to walk slower.) Yes, I’m also someone who rushes, probably too much. It’s hard to have patience in this world of Duke, when everything is deadlines, often sacrificing quality for quantity as we overload or social group or extracurricular ourselves to sleep-deprived exhaustion. The sheer size of our assignment paper was initially overwhelming to me. Filling the page, taking up space—not something I’d ever done before. In my brief stint at Durham School of the Arts many years ago, I’d taken one 2D art class, which focused on mixed media and operated on a more micro level, physically. I knew how to mess around in different media and try new things, as long as it wasn’t bigger than a piece of notebook paper. So, as much as I’ve learned about shading and line weights and negative space in this class, I have to say that the best thing I’ll take away is that my art can, and should, take up space, and fill it out compositionally--and that it's important to have patience to take the time to do so. It’s easy for someone with my personality to be fixed on details and perfectionism, but sometimes it’s more important to adapt to the unfamiliar and make it work for you. I’m glad that as the semester has progressed, my art has also increased in size. My first assignments lay in the dead center of the page, never venturing to the margins—content to stay contained in the lines. When I compare it to the later assignments, I’m glad to note that my art takes up the entire page, inviting the viewer into a space that bleeds past the window of the paper. In Nasher, seeing the giant art hanging in the basement reminded me of the family art studio house back in PR, and made me recall why I was so impressed with the canvases lying in the sun. All my previous art had been struggling to imitate life, rather than allowing room to grow and experiment: it’s fine to allow yourself to grow artistically, and step outside of your comfort zone, even if it’s just to make things big. I have taken a lot of math and science dense courses over my 4 years here at Duke as an engineer, and I honestly would be shocked if it turned out I had retained even 50% of all the stuff I’ve encountered. There have been times where I would look back into the notes of a previous semester to get a refresher on a topic that I needed to get reacquainted with, and I would feel as though I was looking at hieroglyphics, or at the work of a completely different person. For a good minute, I would literally be in awe of how much more intelligent my past-self seemed than myself at the moment, having known this stuff like the back of my hand once upon a time. But the next time that I look back at some of the work from my classes as an undergrad, something will be different. I will be able to look at my drawings from the art class I took my senior year in college and not feel any sense of disembodiment when looking back at my own work. I will always be able to look at my artwork and know that I created it and feel secure in that the person who created this art in the past is one and the same with the artist I am today. I believe the difference is that there is expression of every part of my being in my drawings. My feelings and thoughts on myself and on life are grounded in what I hold to be fundamentally true, and they are also constantly updated or reverted with varying degrees of confidence. I have found drawing to be the most physical projection of this subconscious exploration going on inside my head. I’ve never understood the saying “there’s a reason for everything” more simply and clearly than I have when drawing. In my drawings, every presence or absence of detail, every actual or distorted representation is fundamentally governed by some of my most unconscious decisions (or lack of). I can see my preference of perfection over realism with that straight-edge line where there wasn’t a line to begin with. I can see the warring of “getting the big picture” vs. “details matter” in the messiness of the leaves framing the bold structure of the tree branches. I can see pessimism seeping into the blank expression on my favorite superhero’s face in one sketch, but I can also see a glimpse of hope in the smiling eyes of the character in a different day’s sketch. Drawing is one of the few things I can’t remember ever not enjoying. Considering that it helps give me sense of identity and that it’s my favorite means of unobtrusive introspection, I can’t imagine the day when I no longer enjoy it ever coming. I have mixed feelings about my experience in Drawing 199S this past semester. I definitely do believe that my skills have improved, but it has been much harder than I had anticipated. There have been areas of growth and development as an artist, but also many times in which I have struggled to manage what has been assigned in the timeframe. So much time has been spent slaving over projects, a few flustered hours on this railing, another couple of hours in a flap over the best way to draw this tree. Combined with large time demands in other subjects and travelling for athletics two to three weekends each month, unable to take my drawing board with me, Drawing 199S has presented itself as hard work. Often, I would look at what I had done and try to view it from someone else’s point of view. Many times, the outcome has been underwhelming and it has discouraged me that the ages of work have amounted to little. I don’t feel that my drawings reflect the effort that I have put in. This has allowed me to really appreciate the works of my classmates, many of which were unbelievable. I can only imagine this to be due to their ability to put in even more time and effort than I had, or their proficiency that allows them to produce something beautiful without in less time. Shading is the area in which I have experienced both the most frustration and the most gains. With each of the two week projects, I struggled with underestimating the time required for the drawings, largely because it never sunk in how time demanding shading is, both in more intricate areas such as shadows on rocks and bricks, and in more menial instances like coloring a dark sign. It amazes and exasperates me recognizing that I spent almost as much time filling in the K-ville sign (which despite this extended period I still fail to know how to spell) as I did constructing a circus in the background, which is undoubtedly more complex and requires more focus. The evolution of my shading style towards the end of semester is indicative of my “growth” as an artist. Initially, and in most of my assignment pieces my shading style was largely without much structure – I would color this way and that so as to fill in every last spot, and it has been as tedious as it sounds. However, lately in completing my sketchbook I have started crosshatching and am much preferring this technique. I’ve found that it is a significantly quicker style that, when completed, actually lends a more skilled and consistent look than trying to color in every dot of white, despite the fact that there is still white remaining. It is also much easier to produce different, consistent tones with crosshatching, and I have really enjoyed applying this technique of shading to add detail to the animals I have drawn, particularly in the feathers of my birds. Something that I would love to improve on if I continue with drawing is being able to come up with more original drawings and draw from imagination. The majority of the sketches in my sketchbook are attempted reproductions of images I have been fascinated by and which reflect my interests (if you were to look through my drawings you’d be well aware of my love for winged creatures!). The idea of sketching something that I cannot see before me and which exists only in my head is a daunting one, but I would love to overcome this and be able to create without stimuli and from my own dreams. Surrealism is really enticing, and to produce my own surrealist artworks would definitely heighten the appeal of drawing. Overall, I have enjoyed the past semester of drawing. It hasn’t been easy, though! Monet, Impressionism, & My Struggle to "Describe" Rather Than "Depict"
I’m sure Monet has been selected as the topic of blog posts many times before, but I hope to explain my personal affinity for certain works of his, and in the process communicate something about what I imagine to be the ideal relationship with drawing. Last year I took a graduate neuroscience course on visual perception and the brain, and for my final project I wrote a research paper analyzing the relationship between the biological facts of the human visual system and the development of impressionist techniques. 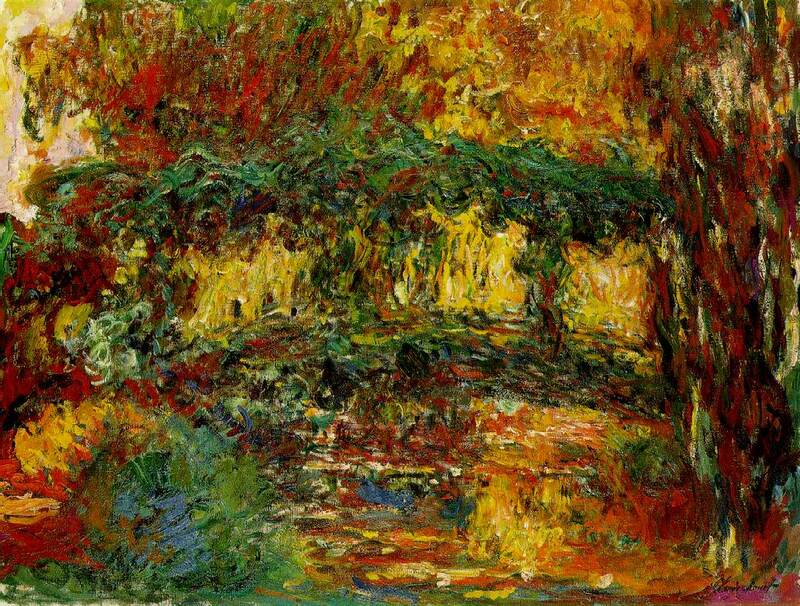 I chose the topic because I had been enamored of Monet’s painting of the iconic Japanese bridge in his garden in autumn; when I saw it at MoMA in New York, I was struck by the parallel between the autumnal season and the autumn of Monet’s life. When I began to ecplore the human visual system this became even more interesting; the fact that Monet had a severe cataract in his later life can be seen in the image and exaggerates his earlier impressionistic techniques. This is fascinating in light of how impressionist art inherently draws on features of the human visual system to create subjective reality out of objectively non-realistic artistic techniques. I also am particularly struck by his commitment to exploring temporality and seasonality. I think my own experience drawing would have been much less stressful if I had been able to understand the nature of objects and thus describe them, rather than attempt to painstakingly recreate. I think one of the true beauties of visual art is its ability to explore what we perceive ephemerally in permanent images. 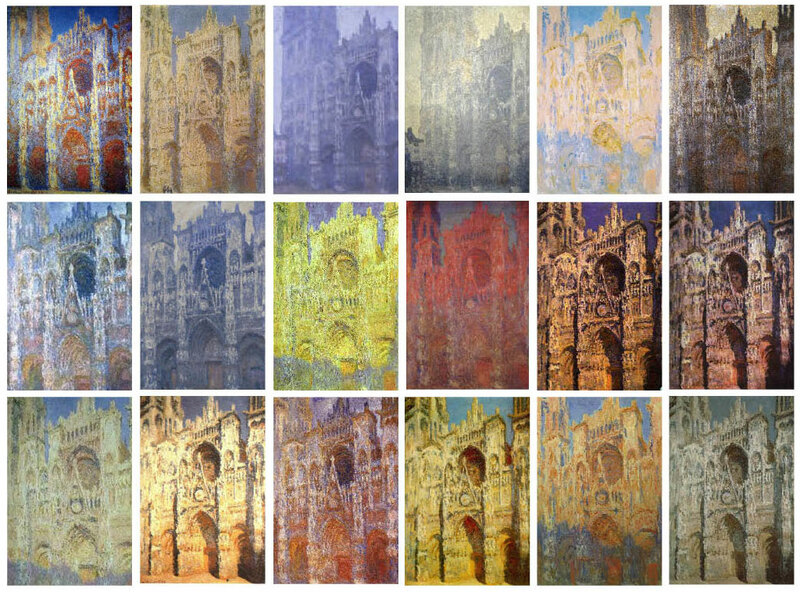 I was fortunate enough to have the chance to visit the Rouen cathedral that Monet painted many times over, and then some years later visited the installation of many of those painting in the Musee d’Orsay in Paris, which only made my admiration for Monet’s expressiveness that much greater. Despite the beauty we see when looking at Monet, one would hardly describe them as perfect. I think my own desire to recreate exactly what I see tends to thwart what could be a much more natural expressiveness that, while flawed, would make a more honest and interesting drawing. I need to learn how to trust what I am experiencing and my own ability to begin at a blank page and constantly revise rather than erase. Interestingly, Monet actually painted over the “first drafts” of many of his canvases, and I relate to that feeling of needing to start over. The difference is that Monet had the time and opportunity to devote tons of time to a faithful, almost ascetic study of individual scenes. In an effort to finish, I feel as though I constantly would forgo the trust in my own ability to express what I am seeing—to describe the objects—in favor of an effort to simply depict them, which ended up usually seeming more time-intensive in the end. Drawing in my past...present...and future. I have always enjoyed drawing. I grew up in an environment surrounded by drawing. I spent a great deal of time at my grandparents house as a child. Some of my favorite memories from my childhood were spent drawing with my grandma, who was an incredible artist. My grandfather is quite artistic as well, and the two of them created an artistic child. My father, who currently does graphic design, is very artistic. When I was not spending time drawing with my grandma, she would show me my dad's art portfolios from high school and college. One drawing of his that I adored was a self portrait of him sitting on the ground looking into a circular mirror. Someday I would love to have that drawing hanging on a wall in my own home. It may not be anything special to someone else, but to me that drawing is my all-time favorite piece of artwork. I believe that my drawing techniques are very similar to my fathers'. I enjoy drawing people more than I do architecture or scenery. I am fascinated by individual's facial features, which is why I love drawing portraits. My father was the same way. His drawings are always focused on the individuals' expressions or facial features. I wish that we would've had the opportunity to draw portraits in this course, but at the same time, I am glad that we didn't. This course challenged me in areas of drawing that I struggle with. One aspect of drawing that I grasped throughout this course was working with lines. I've learned how to visualize certain lines by making mistakes and then realizing where I went wrong. For example, in my last drawing for this course, I struggled with the lines of a road. It took me multiple attempts and a great deal of eraser marks to understand the way in which the lines of the road needed to look. Another aspect of line usage that I attained was the depth and texture of a specific line. Some lines need to be thicker, thinner, darker, lighter, etc. Typically, I draw with a fairly heavy hand, making my lines much darker than necessary. I've learned about various techniques to use in order to get the line wanted. Although I am not the best at drawing, I still enjoy doing it. I have always been a creative minded person, and every time I have a new idea, the first thing that I do is sketch it down. Over the past year or so I have begun sketching fashion designs. I have a great deal of work to do as far as the sketches go, but at least I am able to jot down my ideas when they pop into my head. I also run my own fashion blog, and when I was coming up with various names and logos for my blog, I began the process with a pencil and a sheet of paper. Drawing is a part of my past, and I believe that it will carry on into my future. Whether I'm sketching the latest fashion designs or simply just drawing to relieve stress and clear my mind, it is something that I will continue to do. If I can grow leaps and bounds from where I was one semester ago, then I'm sure my skill level will get higher and higher with every touch of lead to paper. I will most likely stick to drawing portraits because that is my strong suit, but I now know that if I want to challenge myself, then I will tackle some sort of scenery. I began this post by mentioning how great of an artist my grandma was and still is. As she's nearing 90 years of life, she's faded away from drawing. I can tell that she gets frustrated when her hands don't work the same way as they used to. I've been able to bond with her over my various drawings for this course, hoping to inspire her to pick up a pencil again. I like drawing because of how it has changed how I noticed things around me. I started to see how the light reflects off railings, my arm, leaves, clouds...just about everything. I like how I can start to predict what values will look realistic, and see them come together to give an object volume. It probably stems from my science background, but it is amazing to me that we can trick our brains like that. I know drawings are on a flat piece of paper, but I understand what it means when I look at it because of value use. It's just our interpretation of light. Now when I walk under trees, the details in how the light interacts with the leaves is incredible. I used to see a simple tree as a whole structure before, but I understand it as a tall object with tiny leaves, thick branches, shadows, etc, now. Learning how to draw has allowed me to appreciate objects around me and how they relate to each other in space. I notice many new details. It isn't just looking at something and noting what it is, but rather looking at an object and appreciating what makes it look as it does. I hadn't done that until I started drawing this semester. On the other hand, drawing has been EXTREMELY challenging for me because of this abstractness. Even when I try to draw "what I see," I feel like my mind takes over in trying to predict what it should look like on paper. When this happens, the lines feel empty to me. I can tell they aren't coming together into what I want, but I have to keep going so that I can figure out what would work the next time around. It feels frustrating because I want it to be simple (and it is)...but my own mind prevents that. I have to get into a drawing "flow" to really start a project because of this. I cannot work in spurts at all, which has also been difficult as it is hard to find gigantic chunks of time where I can draw. Also, I always found that drawings never felt finished to me, but adding more details in the background made me worry that I was going to mess it up. To get better, I know I have to push myself to go for it anyway. So, drawing has challenged my approach to work on multiple levels--time management, confidence, and giving into the drawing (to name a few). Sometimes I had to just go with the moment when I felt like drawing, and I couldn't wait or put that moment off or else I'd lose the inspiration. Overall, I hadn't drawn before this class, but now I will continue drawing/sketching on weekends. I like how aware I have become of my surroundings, and the mental challenge that drawing provides. It is a wonderful contrast to the science classes I have taken. I have learned as much about drawing as I did about how I function in tackling a project. 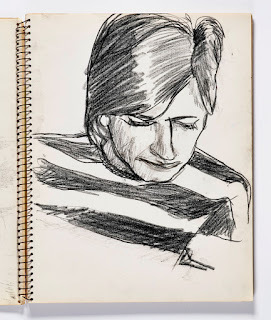 Because I was committing to long drawing sessions, free from distraction, it was one of the few times at Duke where I had to truly pause and be "in the moment." For a long time I had been trying to learn how to draw. Drawing was not part of my school’s curriculum, so my only experiences had been by myself — and I had failed miserably at them. As years passed, I focused on graphic design. Yet, not being able to draw limited me. The need to illustrate motivated me to take this class. 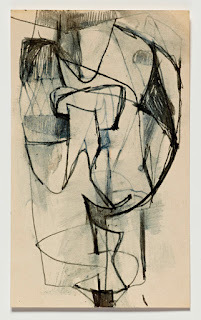 I came into Drawing 199 with a desire to construct: to learn how to translate what I had in my head into drawings. Instead, throughout the different assignments, I found myself deconstructing objects into shapes, lines, negative spaces, and values. I found myself trying to see Ciemas as triangles and rectangles, and translating the shadows cast on a white leg into different shades of gray. “Life drawing” popped up in a recent conversation I had with an arts educator that works on creativity research. She was talking about how creativity starts with problem finding, an ability that is significantly underestimated in education. She mentioned that the value of the arts is in how they train you to be observant, which is an important skill for problem finding. Hearing her say that made me realize that my urge to learn how to translate my thoughts into illustrations had been overshadowing the previous and fundamental step of learning how to observe and deconstruct the world. I realized that what I have learned during these 14 weeks of life drawing is to observe carefully. Unexpectedly, these weeks took me back to the time when I used to do photography, challenging me to deconstruct buildings and people and objects into shapes and lines and colored surfaces. This class trained me in the process of “deconstruction for construction” that underlies drawing. I am fascinated and intrigued by the role that art can play in education: its role in aiding the teaching of other subjects and its role as a subject itself. Having the opportunity to experience a drawing class has given me some perspective on how the process itself can contribute to teaching practices. I believe the process of “deconstruction for construction” is at the core of drawing’s role in learning. Below, some of my thoughts. Drawing trains you to be observant. Drawing makes you look carefully at the details. It makes you patient. It makes you realize that every time you return to something, it looks different and it is different. The deconstruction of what our eyes see is an interesting process that allows us be critical of what we perceive. Being a good observer is critical for problem finding and it is fundamental to being a good communicator. Drawing teaches visual literacy through hands on experience creating visual material. The constant process of deconstruction and construction makes you wonder what the differences between seeing and perceiving are. It makes you question your interpretations of the visual world. Producing visual material is a great way to realize that nothing is culture-neutral and that every choice must be interpreted with caution. Drawing can help you understand. In fact, there’s research on how drawing graphics can aid learning in science by helping students organize their knowledge, integrate new and existing information, and ultimately generate new inferences. It has been a great experience to participate in a drawing class whose aim is fundamentally artistic. Not only did I get better at drawing, but I got to experience and examine its benefits of art instruction. I look forward to learning more about how illustrations, graphics and other kinds of drawings can serve as teaching tools. I have always thought that looking at someone’s drawings is like having a window into their thought-process. By stripping things back to the most basic, essential form of art — nothing more than mere pencil and paper — drawing, for me, is a powerful means of self-expression. Even if everyone uses the same pencils, paper and subject-matter, no two drawings are ever the same. This variation in artistic styles that makes drawing an intensely personal process for me, as every drawing provides an insight into an artist’s personality, mood and character. It was striking to see and discuss the drawings of different members of the class each week. Even though everyone had the same assignment briefing and raw materials, our end products were strikingly different. Some people used heavy tone and bold mark-making, while others opted for much softer lines. Some people used cross-hatching and contrasting textures, while others went with smoother gradations in tone. Compositions also differed radically, in terms of what people chose to include, the angle adopted, and the scale of the objects. These differences — both technical and compositional — gave every piece a distinct feel. I was drawn to drawing by this powerful sense of individuality. The simplicity of the elements involved in the process — just a stick of graphite or charcoal — really emphasised these contrasts in styles for me. By the end of the class, when Professor Fick pinned people’s drawings to the wall, my classmates’ different styles were immediately apparent and recognisable. Every choice about composition, structure, tone and mark-making provides an insight into the artist’s thought-process: how they process things; how they express themselves. The class taught me that as much as you can learn the techniques and methods of good drawing (how to show depth, use perspective and so on), there is much more to it than that. Drawing is also a deeply personal process; there is no one “right” way to draw. This sense of freedom, self-expression and lack of defined answers attracted me to drawing as welcome contrast from regular class work. Back in high school, my art teacher always used to tell us: “every good artist, without exception, starts by drawing well”. Reflecting on this semester of drawing, I have to agree with him. Drawing, to my mind, is the cornerstone of all art: the foundation of everything that comes afterwards. To master painting or sculpture, the first step is putting pencil to paper. Nowhere did this become more clear to me then looking at some of Richard Diebenkorn’s works while visiting my brother at Stanford University in February. Diebenkorn is famous for his paintings — particularly his “Ocean Park” series — which are instantly recognisable on account of their angular lines and focus on shapes. Although his paintings are striking in themselves, they were even more impactful when seen in the context of his sketches. Diebenkorn referred to his sketchbook as his “portable studio”: the place where he was free to experiment and hone his artistic approach. The drawings shown here provide an immediate insight into his style — sharp mark-making and strong tonal contrast — that also comes through clearly in his paintings. 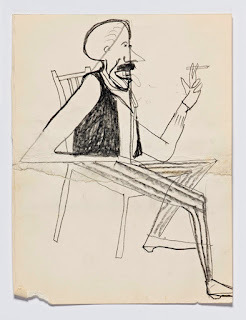 Furthermore, beyond Diebenkorn, I think that all the art I have seen this semester — Monet and Giorgione at London’s Royal Academy, Delacroix at London’s National Gallery, the Nasher Museum collection here at Duke, and the Ackland Museum collection at UNC Chapel Hill — stems from the essential foundation of drawing. Drawing continuously over the course of the semester has been a powerful experience for me. It has challenged me to create engaging compositions, to develop my personal drawing style, and to improve my ability to observe. What makes drawing so powerful, for me, is the process of simplification and reduction that it involves, taking art back to its most basic, striking form. 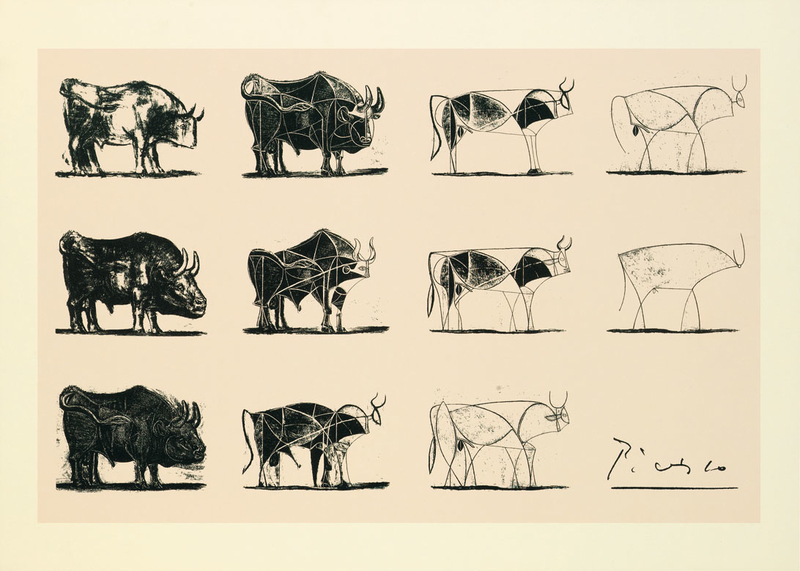 This is shown emphatically in Picasso’s famous depiction of a bull in a series of lithographs, each one more simplified in its lines but conveying the animal’s distinctive shape and character equally well. The fact that that the world’s largest company, Apple, uses Picasso’s simplification of the bull to teach its new employees the importance of reduction shows the power of drawing as a way of processing information. Picasso’s lithographs have also shown me that effective simplicity is harder to achieve than it may appear. Likewise, the journey of developing my own drawing style over the course of this semester has been a challenging but immensely rewarding learning experience.